“Hey dad, you know how I sometimes complain that it’s freezing when the kitchen is 18ºC at home?” Tadhg and I were just finishing up our day’s ride on Lake Minnewanka from the LM 11 campground to just past the end of the lake at the first of the Ghost lakes. It was -15ºC, not that cold, but significantly colder than our home. We started out on Friday afternoon after finalizing our planned destination on Friday morning. Our original destination was going to be the site of a snowmobile rally, and though I never mind having snowmobilers on the trail with me and offering me beer, I thought hundreds might intrude on the tranquility I was seeking. The trail was in great condition, but we decided we would make better time and see more of the mountains by riding on the lake. I could see skate ski tracks on the lake and if snowpack is hard enough to skate ski, it is hard enough to fatbike. We indeed moved quickly along the ice, and a scant 3 hours after leaving the parking lot, we found ourselves at the LM11 campground where we had booked both nights. LM11 in this case is a bit of a misnomer in that we only rode about 8km to get to it – I don’t call it cheating since if we took a canoe or kayak in the summer, we would travel a similar distance. With sunset at around 5pm, we had an hour or so to ride in the dark, or at least twilight and the sunset over the mountains reminded me of how much I like this place. We had camp set up in a very short time. Having cleaned my stove on Thursday meant that I had boiling water from snow in very short order. Our dehydrated meal was home made refried beans and cheddar which is always popular with Tadhg and I have to admit is quite delicious. We spent some time off and on during the evening walking out on to the lake to look at the stars and watch for aurora. Though the aurora did not appear for us, the sky was clear and we were treated to an impressive array of stars. Tadhg spent some time speculating on their trajectories – different than his sister who invents and names constellations. In spite of the fact that we were sleeping by 10pm, Tadhg and I managed to sleep in till 10 in the morning. It was nearly noon by the time we loaded up the bikes for a ride down the lake. Though we were planning to return that night, I made sure to bring enough to spend the night in case something went wrong. The temperature was -18ºC when we left the campground – not very cold, but well within the realm of dangerous to the unprepared. We made it to the end of Lake Minnewanka where it drains to a river and then a series of Ghost lakes. We rode on the river bank as far as the first Ghost Lake and decided that was a good point to turn back. In hindsight, we both probably had plenty of reserve energy, but when you are that far away from rescue, taking chances is probably not the wisest choice. At the LM20 campground, we saw some fresh cougar tracks. We didn’t see the cougar, so it was either gone or hunting us. The east end of Lake Minnewanka is in my opinion the more impressive end of the lake. I highly recommend it as a fun destination. We were back at camp and done eating by 5:30 on saturday, so with heavy clouds in the sky, our entertainment recourse was to lie in the tent reading. Fortunately, I had brought the book I am currently reading to Tadhg and more fortunately, we were not that far along in it because after 3 hours of straight reading, we made substantial progress. Our Sunday morning started early for Tadhg with us getting vertical at 8:30. The sky had cleared and the temperature was moving upward with it being above -10 when we got up and warming as the morning progressed. By the time we hit the trail at 10:45, it was only single digits below freezing. For the trip out, we decided to take the trail since it looked to be almost rideable. In fact, as I pushed ahead and rode 20% of the trail and pushed the rest, Tadhg was merrily riding along in my bike’s track. We took to the lake at the washout next to LM9, and rode the lake for the km or so to LM 8 where we returned to the trail. From there, the trail was fast and comfortable for great riding all the way to the parking lot. “More food please.” We had been in the car for an hour and a half. He had eaten 2 pears, 2 oranges, an apple, a sandwich and a granola bar. We were popping in to get our camp permit anyway so I picked up a pair of masala dosas to go and we headed out of the Banff townsite with Tadhg stuffing his face. After packing the bikes, we were on the trail by 3:30, our plan was to bike 11km along the Lake Minnewanka trail to the very originally named LM11 back country campsite (actually, it has a name, it is numbered to avoid confusion). The trail starts out with a bit of climbing, but most of it is rideable by Tadhg since he has been riding to school this year and is super fit. The trail is not so snow covered that we need the fatbikes we are riding, but they aren’t totally overkill either. Tadhg has grown over the last couple of years so he now carries his own clothes and sleeping pad, as well as the 3 liters of gatorade that he loves so much. Several snack stops down the trail, we come to the LM8 campsite. Though it is now twilight, we decide to press on, but not for long, as dark comes early this time of year. By LM9, it is full dark and we decide to camp. Unfortunately, we have neglected to bring a book, since dinner and food hanging is done by 6. After a bit of walking around, we decide to turn in around 7. With the temperature forecast to only go as low as -9°C, I have no concern about the cold. I didn’t even bother to zip my sleeping bag, since using it spread like a quilt lets me move much more freely. Several times during the night I am awakened by the pitter patter of unwelcome little rodent feet as mice or voles seem pretty convinced that they will find food in our tent. Where are the owls and martens that we love so much? Even our properly hung food bag does not escape attention as one of our granola bars is 90% eaten and another few have been opened and sampled by some sort of critter capable of robbing food from a bag suspended by a metal cable. Since we now have the whole day to ride, we decide to head further away from the car. After 5 km and several snacks, we turn back. Tadhg’s riding continues to impress me, there are some rock gardens and technical sections that he would have been walking just this summer, but they are trivial to him now. As we got to the LM8 campground, we realized that one od Tadhg’s mittens was missing from his bike. Though we rode back to look for it, we did not find it, but we did get some more riding done on this wonderful trail. We also ate more snacks. Even with the one mitten lost, we did have a great overnight ride and both Tadhg and I called the trip a success. The final stats ended up: day 1 – 9.5 km, day 2 – 27 km. The only climbing that seemed significant was the 100m gain at the car end of the trail. Winter Fatbikepacking With a 9 Year Old. I have a passion for winter bike riding. I love sleeping outdoors in the cold. This year, my son finally reached a height where he can ride an extra small sized Salsa Mukluk comfortably. It therefore made sense that we should go out together on a fatbikepacking weekend. 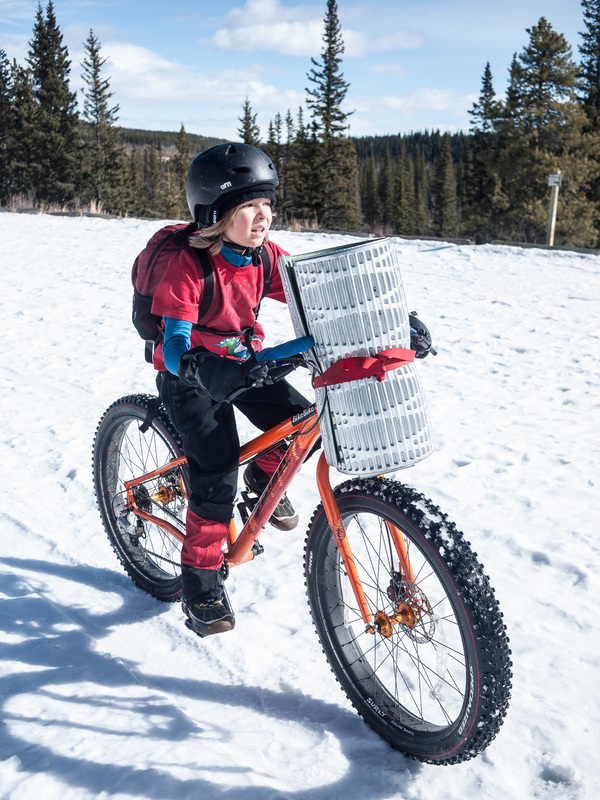 Continue reading Winter Fatbikepacking With a 9 Year Old.